The Project 15 Delhi class destroyers are the largest warships to be built in India, constructed at Mazagon Dockyards in Bombay. While the ship's design is based primarily on the Soviet Kashins, the design also draws from the Godavari and Sovremenny classes. 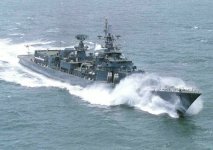 The Cabinet Committee on Political Affairs (CCPA) approved indigenous construction of three Project 15 frigates at a cost of Rs 150 crore in 1977 as a continuation of Godavari Class Frigates under construction at MDL. CCPA approved revision of the cost to Rs 237.30 crore in 1981 at 1980 price level on the basis of quote by MDL. These frigates had improved specification over the ones planned in 1977 and were expected to have improved capabilities for countering missile threat to operate in an increasingly intense missile environment. The production of first frigate was to commence in 1982. Naval HQ revised the staff requirements in the light of lessons learned from the Falkland War of April 1982. Government, approved in September 1983, plan for seeking foreign assistance for re-designing the frigates. 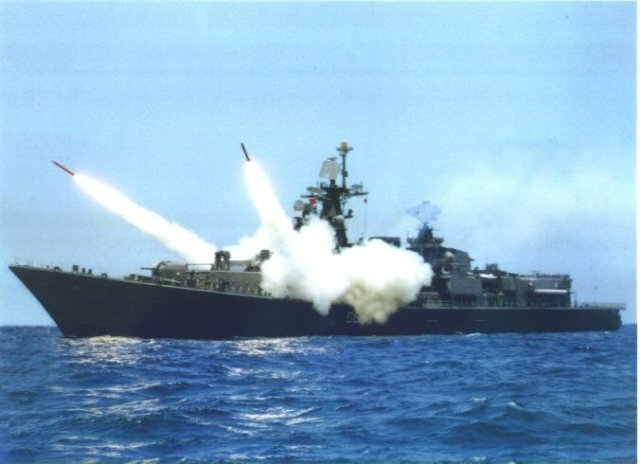 The design was modified for larger and enhanced capability frigates with foreign collaboration from 1984 and the General Arrangement Design could only be completed by 1985, i.e. eight years after the original CCPA approval in 1977. The actual construction of the first vessel started in November 1987. The frigates were expected to be constructed in a period of about 5 years and delivered between mid 1992 and 1996. 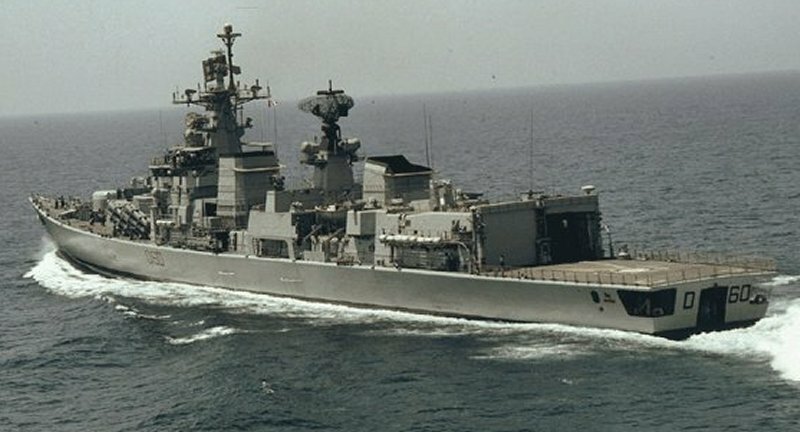 As the commencement of construction of the first frigate was delayed by more than five years and the tonnage of the frigates was also revised, the cost of the project was revised upwards to Rs 882 crore at March 1987 price level, for which CCPA approval was obtained in February 1989. 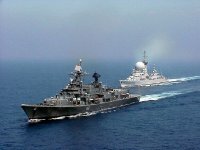 The delay in delivery of the frigates was largely due to frequent changes in the design by the Navy and lack of proper planning. In the case of Project 15 ships, there were as many as 32 design changes up to May 1994. Even then the designs had not been completely frozen. This led to frequent re-working of large sections of the frigates and consequent delay. As a result of delays due to frequent changes in design etc., the estimated cost of Project 15 frigates, which was approved by CCPA at Rs 882 crore in 1989 had shot up by 142 per cent to Rs 2137.11 crore, as per draft CCPA paper of 1995. Conclusion of a cost-plus contract is against the general orders of the Government and also against the pricing policy promulgated by the Ministry in September 1984 for construction of ships. As per the pricing policy, only the contract for the first of a series of ships should be on cost-plus basis and the remaining should be fixed price contracts. Naval HQ concluded cost-plus contracts with MDL and GRSE for Project 15 and 16-A in November 1992 and July 1993 respectively for all the frigates Since there was a gap of two to three years in commencement of the cardinal activities of the first and second frigates, it should have been possible for Navy to conclude fixed price contracts for the second and third frigate Naval HQ also ignored the fact that GRSE was to construct frigates on a proven design with technology transfer from MDL The Ministry's proposal in July 1996 to convert the cost-plus contract to fixed price contract has also not been acted upon. The Cabinet Committee on Political Affairs (CCPA) in its approvals for Project 15 and Project 16-A frigate' had laid down delivery schedules between 1987 to 1989 and 1993 to 1995 respectively Subsequently, at the time of signing of the contracts by the Navy with MDL and GRSE the delivery schedules were fixed as 1996-99 and 1995-99 respectively. However, even these delivery schedules have not been adhered to. CCPA had approved about 5 years time for construction of frigates in both the projects. However, Naval HQ signed contracts with MDL and GRSE with construction periods of nine years and seven years for Project 15, Project 16-A respectively. Even these extended time schedules have not been adhered to. On 16 May 1996, a fire broke out on board the first frigate of Project 15. The Board of Inquiry ordered by MDL suspected deliberate mischief /sabotage and commented on inadequate fire fighting preparedness at MDL. The loss due to the fire was assessed at Rs 2.16 crore and the cost of repairs had been assessed at Rs 2.26 crore. Yet another fire broke out on 10 October 1996 on the same frigate. Naval HQ contended in May 1997 that this fire did not damage any of the items on board and had therefore no cost and time overrun. Indian Navy has consciously taken the difficult route of indigenisation in consonance with the national endeavor towards self-reliance. The Navy embarked upon a program for indigenous construction of ships and development of major sub systems, sensors and weapon systems with the help of Defence Research and Development Organisation (DRDO) and Defence Public Sector Understandings (PSUs). 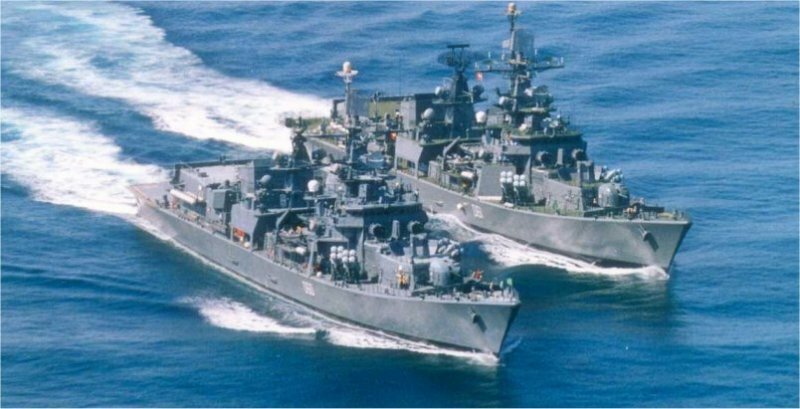 Commissioning of the indigenously built destroyer, INS Delhi on November 15, 1997, & commissioning INS Mysore on June 2, 1999 have enabled the Navy to become a builder's Navy and not just be a buyer's Navy. INS Mumbai, a guided missile destroyer, was commissioned into the Indian Navy in early 2001. The ship, designed in India and built at the Mazagaon Docks Ltd, Mumbai, has more than 70 per cent indigenous components. The naming of the guided missile destroyer as INS Mumbai is a tribute to the port city and its people. The Indian Navy has also decided to affiliate INS Mumbai with the Maratha Light Infantry Regiment of the Indian Army. This is in keeping with the renowned martial tradition and achievements of the Marathas. INS Mumbai is the third of the "Delhi Class" of guided missile destroyers and represents the cutting edge of combatant technology in the country. The ship is one of the largest and most powerful battle ships built in this part of the globe and has a displacement of 6,700 tonnes. She is propelled to a maximum speed of 32 knots by four gas turbines (64,000 horsepower) and has a crew of 40 officers and 350 men. INS Mumbai has an immense firepower with a weapon package comprising surface-to-surface missiles, a battery of surface-to-air missiles, a 100 mm gun, four 30 mm Gatling guns, torpedoes, anti-submarine rockets and chaff decoys. In addition, she has a state-of-the-art sensor package of modern radars, sonars and electronic warfare suites. The ship is capable of carrying two indigenous Advanced Light Helicopters (ALH) onboard, providing the much needed "extended reach" to a modern surface combatant. These helicopters armed with missiles and torpedoes as well as sensitive sensor suites are formidable force multipliers. With her fine lines and proven seaworthiness synergising with the formidable weapon and sensor suites, INS Mumbai is a daunting adversary and lives up to her motto; I am invincible. INS Mumbai is not the first ship to be named after one of the greatest maritime hubs of the world. The first warship to be named after the economic nerve centre of India, the Honourable Company's ship Bombay was built at the Bombay Docks and commissioned by the then Governor of Bombay in 1739. 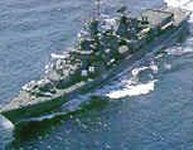 The last of the Bombays was "HMIS Bombay', a 733 ton-fleet minesweeper, commissioned in 1942, which was later renamed as "INS Bombay" on January 26, 1950 and served the nation till 1960.